This time I did my drawbore pegs correctly (not like the last time). I used hide glue just in case I may someday need to replace a part. Then I got the base glued and bolts installed. I found the installation of the bolts and actually getting them to engage tricky and it took a lot of fiddling. 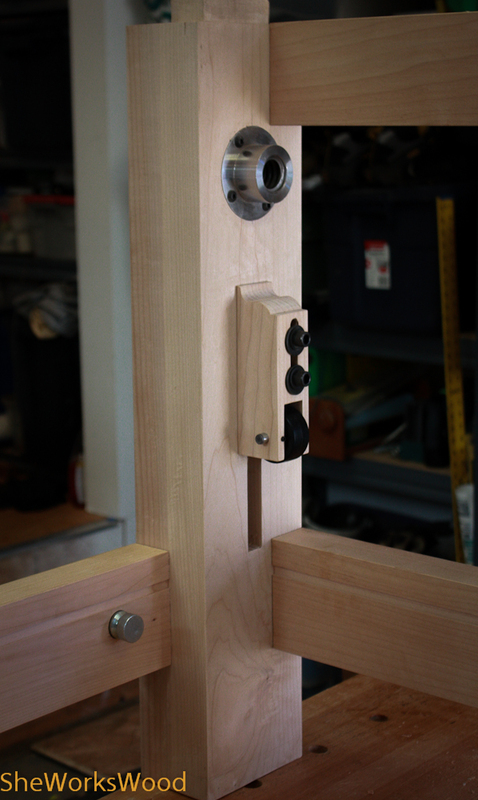 This entry was posted in workbench and tagged drawbore pegs, workbench. Bookmark the permalink. We’ve all made ‘em…… joints that don’t fit, that is! Living in a very changeable (humidity wise) climate in Wales, I have almost abandoned the use of adhesives, except for very small pieces, in favour of close-fitting mortice and tenon joints, draw-bored. These joints are incredibly strong with the advantage that you can drift the pegs out and dismantle the joint with a minimum of fuss should you need to. (I never have!). Thanks for the comments! I followed the link to your site and added it to my reader. Looking forward to reading more about what you’re doing. Thank you for the reply. As you’ll see, I’m sold on draw bore pins. I forgot to add that I try to remember to leave a tiny note with my name, date the piece was made and a few words folded under one of the mortices……. You never know who will read it and when…. Really! I’ve left (and found) notes, newspapers, etc. in the house walls for remodels, but I’ve never thought about doing that in my furniture pieces. What fun! Did you use a dowel plate? I am having a very hard time going from the 1/2″ hole to the 3/”8. 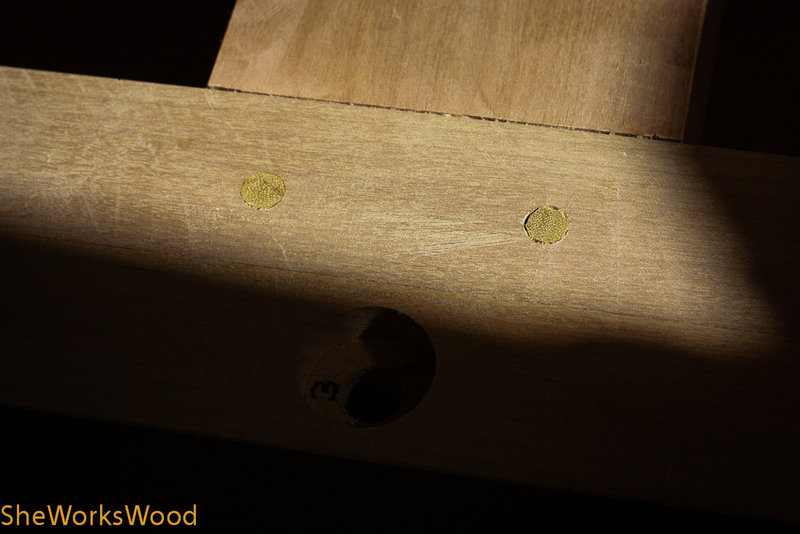 I break the dowel almost every time, using a variety of woods, with the dry oak I have being the most fragile! I might need to make another plate with an in-between size. 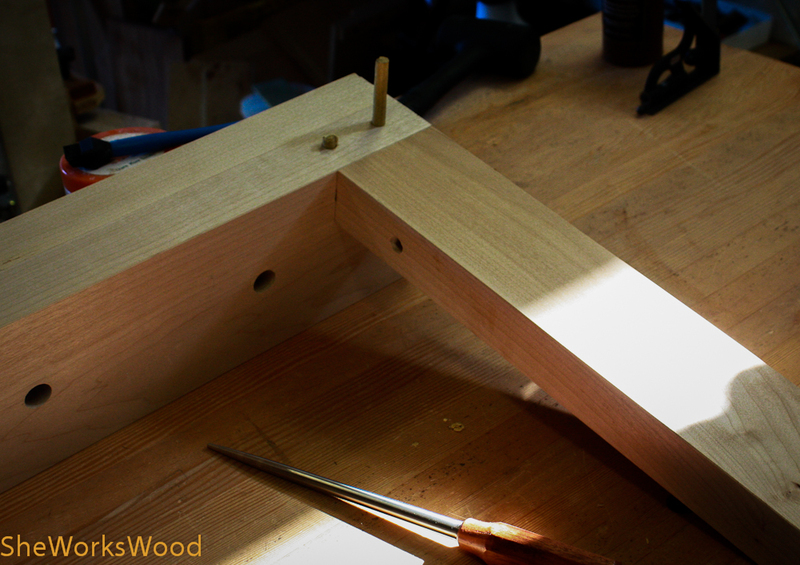 I do whittle the pegs after the 1/2″ step and wax them well, but still have a lot of trouble. I assume you’re using 1/4 sawn wood? I ran my block plane along the pegs too between the 3/8″ and the 1/2″ dowel plate on all sides. That seemed to help too. The challenge is holding the peg while you plane it.